Last week I went to the British Library’s Magna Carta: Law, Liberty, Legacy exhibition and, amid talk of King John, Edward Coke and the banning of fish weirs on the River Medway, I had a chat with a chap whose travel magazine (called TRVL) has been going for around four years and has something approaching 2 million subscriptions. 2 million! 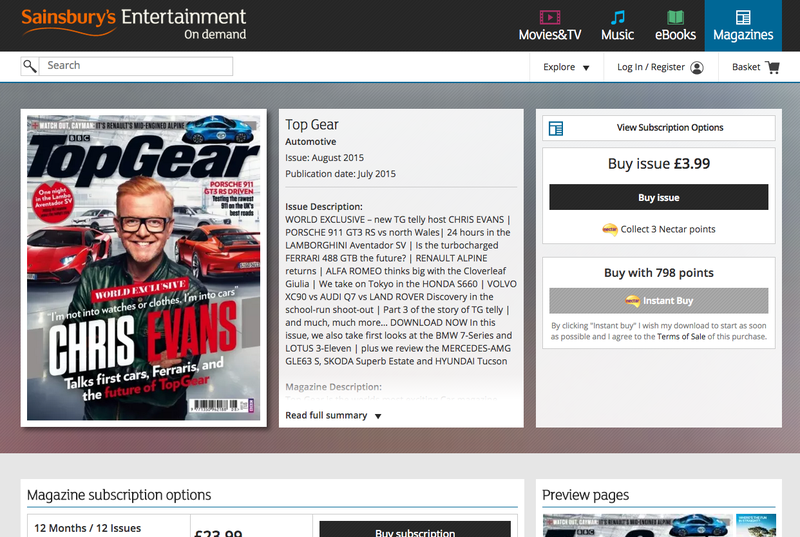 – how many have your digital editions had in that time? The galling thing for a marketer is that most of these have been generated through word of mouth. It doesn’t follow all of the ‘rules‘ that I think should apply to a digital magazine, but it was purpose-built for the iPad, not reverse-engineered from some print title. And because it was conceived in that way it doesn’t have any of the messy compromises that magazine apps have – it doesn’t feel the need for every issue to appeal to every reader; it can focus on long-form content, its content is not time-sensitive. What it doesn’t have yet is a significant income stream, nor much of a website to speak of – there are premium subs and some advertising (although they face that classic problem of being read internationally, but with advertisers who book ads nationally) – and I don’t know what the level of engagement is, but it shows that there are people out there doing things in a way that traditional print companies are not, and achieving the sort of reach that digital editions of print magazines are not getting close to. How thrilled are you with the sales of your PDF page-turner now? I posted this picture on LinkedIn yesterday as it’s a classic case of a missing detail buggering up an entire campaign. 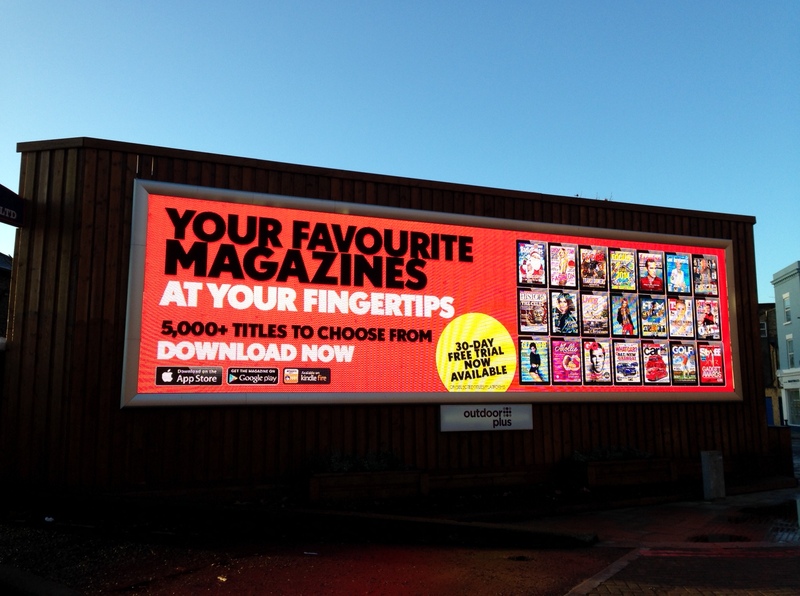 The advert is on an electronic billboard near the office. It’s a big display, on a prime site that’s passed by thousands of cars and pedestrians each day. It’s an ’impactful’ poster with a simple, clear message, strong colours and compelling visuals (magazine covers are always eye-catching). The one problem is that there’s no way of knowing who the advertiser is. There’s no web address, no brand name, and when you google “your favourite magazines” you get Future’s shop site (’MyFavouriteMagazines’). I’m reasonably sure the advertiser is Zinio because of the range of publishers on show, the number of titles they mention and because of the digital emphasis, but I’m not 100% certain. If I’m in the dark it’s unlikely that a consumer would be any wiser. This can’t be a cheap place to advertise (and they’ve apparently also got the same ad on a site in or near Westfield) and whatever has been spent is utterly wasted. Magazine industry veteran in optimism shock. Last Friday I came out of a meeting with a group of publishers feeling vaguely optimistic about the future of the industry – which is something that I can’t say has happened for quite some time. I was moderating a user group meeting for one of the subscription bureaus and present were clients representing B2C and B2B publishers, big and small titles, UK and international. The details of what was discussed aren’t important (and are anyway bound by the secrecy of the confessional), what was encouraging was the attitude. Although many of the people there talked about a ‘digital first’ strategy, what they were actually pursuing was a ‘customer first’ strategy – they want to deliver their product however the reader wanted to consume it, whether that was in print, digital, bundle, web, app, whatever. 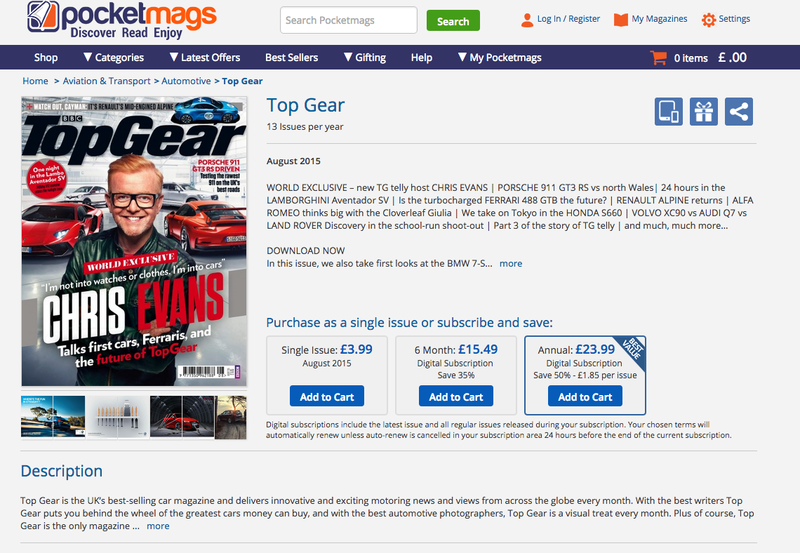 Some interesting conversations with publishers last week about digital editions of magazines. The excitement of the launch of these products has settled into a realism about their use and about their limitations. There are still a few publications where the digital version is being set up as the replacement for the print edition, but in many more cases the new medium is viewed as supplementary to the old. As the Dovetail Digital Subscriber Survey shows, the number of “digital only” subscribers (i.e. ones that have no print product subscriptions) is vanishingly small (<1%). It will grow, but the much greater number are those mixing print and digital products.